Gazprom and the European Union are about to enter in negotiations. "There is a possibility of a fine, but I don’t think it will be imposed," he said. "I am a strong believer in sitting down at the negotiation table and working out an agreement," he added. Likiwise, Gazprom is open to discussions about the disagreements with the EU, said Deputy Chairman of Gazprom’s Management Committee Alexander Medvedev. "I plan to meet with the Deputy European Commissioner for Competition to discuss the issues face to face," Medvedev said. On the same note, another member of Gazprom’s Management Committee, Vladimir Markov, observed that Gazprom could hardly be considered a monopoly in Europe, with no more than a third of its gas market. As reported earlier, the European Commission has launched an antitrust investigation into Gazprom over three charges of suspected restrictive practices. According to a statement by the European Council, Gazprom is accused of hampering the free flow of gas between EU members by dividing markets, preventing the diversification of gas supplies in Europe, and imposing unfair prices on its clients by linking them to the price of oil. "The investigation does not target Russia but merely looks into the practices of Gazprom, which has a share of the EU market," said EC spokesperson Antoine Colombani in response to a statement by Russian President Vladimir Putin expressing regret over the investigation. "Like all other companies operating on the single European market, Gazprom has to follow EC competition rules." Yet Putin argues that the "united Europe wants to reaffirm its political influence, and wants us to pay for some of it. This is not a constructive approach,’ he added. In turn, Gazprom insists it has not broken any European rules. 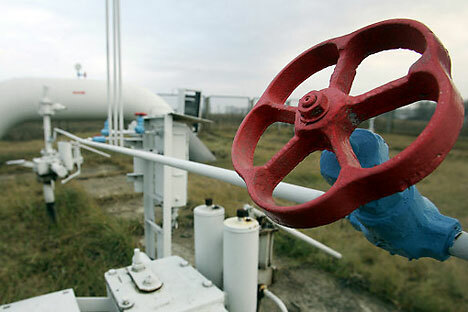 The Russian gas company was actually a pioneer in the liberalisation of the European gas market ‘without expecting anything – such as a share in the market – in return,’ Medvedev stated. He went on to explain that Gazprom still suffered from capacity constraints on the European market, and invariably complied with the laws of the countries in which it was present. "As far as abusing our dominant position, we operate on a strictly contractual basis, and any price revision requests should be justified," Medvedev stressed. He also added that the only companies with which Gazprom had thus far failed to agree on contract prices were the Czech Republic’s RWE, Poland’s PGNiG and Lithuania. A forceful change of the gas price formula is likely to enhance the competitiveness of Russian gas on the European market and ensure the long-term growth of gas exports, President of East European Gas Analysis Mikhail Korchemkin wrote in his LiveJournal blog. It is unlikely that he European Commission will actually fine Gazprom; most probably, the Russian monopoly will commit to creating the conditions necessary for perfect competition, i.e. it will agree to swap operations, virtual reverse flow, etc. According to Korchemkin, the ‘national asset’ will definitely benefit from all these measures, as will Russian consumers, since domestic prices based on equivalence in cost effectiveness will also go down. The antitrust investigation is an instrument for pressuring Gazprom into concessions in gas price negotiations, believes Dmitry Aleksandrov, head of analysis at UNIVER Investment Group. He did not rule out the possibility of penalties being imposed on Gazprom, however, as the EU has already been successful in proving the guilt and justifying sanctions against other companies on similar charges. Meanwhile, Gazprom’s pricing policies may in any case suffer a dramatic change in the near future, in line with a recently signed decree requiring government approvals for all ‘strategic’ export contracts (which certainly includes gas supplies to Europe). This means that the government will be regulating gas prices for European consumers ‘by hand,’ and Gazprom will no longer have much sway there. The article isbased on RIA Novosti, Prime Business News Agency and RBC Daily.